My eldest daughter, Laurie, started researching family history when she was a teenager, starting with a collection of letters and photos and records my mother-in-law had assembled in plastic sleeves before her death. Laurie pored over those family history notebooks for weeks, learning her great-grandmother’s script in order to read correspondence. About that time, I had grown discouraged in my own writing. Oprah hadn’t noticed my work, and book publication seemed more like a letdown than anything else. I mentioned to Laurie that I wasn’t sure sometimes whether I even wanted to keep writing. Maybe I would focus on editing and mentoring and let my own work fall to the wayside. It took (it takes!) so much effort—and for what? So a few people can buy a book or read an essay and then put it on the shelf. She went on to compare my writing with that of her Texas ancestors, who left nothing of their minds as a record for those who might read their writings later. My daughter is an adult now, setting her own mind down on the page in poetry and nonfiction. Over the years, her encouragement and interest are a large part of what has kept me writing. I’ve become convinced that we must write while we are able, to record family history, to explore the significance of our lives, and to put our own thoughts, memories and passions on the page—if not for an adoring public, then for our daughters and sons and those who will come after us. Let’s create a record of these lives we have lived. On Thursday evenings, April 12 through May 3, I’m facilitating a course in McMinnville, Oregon, on life writing for those who realize how important it is to put heart and mind on the page. Join me! 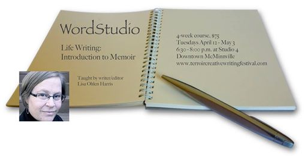 To register for Lisa Ohlen Harris’s WordStudio workshop, download the registration form here and return by mail.